Watch Dr. Rodriguez's insights on what the Breast Health Center offers patients and what is most rewarding about his job. 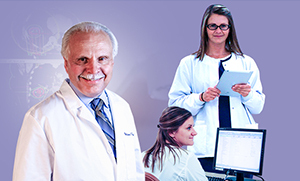 Meet Dr. Guillermo Rodriguez, a medical oncologist. When did you first decide to practice medicine? Dr. Rodriguez's father was a doctor, so when he was little he asked if he could go on rounds with him. His father was an orthopedic surgeon, and Dr. Rodriguez liked hearing the stories of how his dad helped his patients. Why did you choose to specialize in medical oncology? He said that the events in life lead to where you are today. When he was in high school and college, his best friend was diagnosed with testicular cancer and eventually died. What is amazing about it is that he could be alive today if he had developed cancer just one or two years after he was diagnosed because of the advent of chemotherapy. 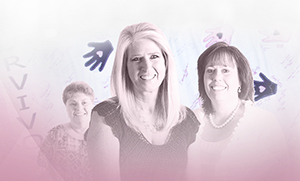 What does the Breast Health Center offer its patients? Dr. Rodriguez believes every person is a story. Every person would say they came in not planning on being told that more tests or a biopsy were needed. He has yet to meet someone who is not devastated by the diagnosis. His job is to offer them hope that something can be done...that it isn't a dead end street. There are things that can be done so patients end up well. Just having patients come in for follow up, especially five or 10 years out. By the book, they shouldn't still be here today. One of the things that has happened over the years compared to when he first started out is statistics have changed. Statistics showed that about a third of women with breast cancer were going to die. That's an incredible amount when there were about 180,000 cases back then. And about 60,000 would die. Nowadays the statistics show the numbers continue to increase in terms of how many women are diagnosed per year, but the number of deaths is coming down. When you see women who, by the book, were not supposed to do well, and here they are, they make his day. When they come in, he sometimes tells them, "YOU made my day today. Seeing you made my day." To him, that is the most rewarding part.